According to Pinterest, you can expect to see plenty of people dressed as Pennywise the clown, Stanger Things characters, Wonder Woman, Belle from Beauty and the Beast, and oddly enough, giraffes this Halloween. All of these require some planning, but here’s some inspiration for creative last-minute costumes when you’re in a pinch. Everyone knows and loves the babbling minions from Despicable Me. If you have an old pair of overalls at home, you’re halfway to having this costume completed. Pair them with a yellow shirt or hoodie and these DIY goggles and hat, and you’ve become one of these adorable evil sidekicks. 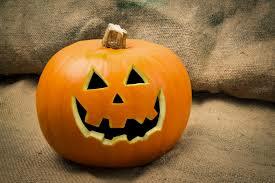 Most people will be able to find everything they need to dress up as an Office character in their closet. 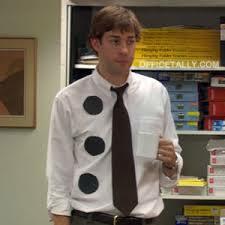 You can be three-hole punch Jim by wearing basic business casual clothes and adding three paper circles. Another in your group can be Pam with a basic skirt, cardigan, and of course, white Keds. An old brown suit, yellow shirt, and Aviator-framed glasses make the classic Dwight Schrute. Have an old white t-shirt and a Sharpie? Write “Error 404: Costume not found” and your costume is ready to go. This one is just as easy. Again, grab a white t-shirt, write “life” on it, and carry around a bag of lemons. Hand out some lemons for the full effect. All you really need to channel your inner woodsman is a flannel shirt, jeans, and a pair of boots. Add some accessories like a stocking cap and suspenders to really feel like Paul Bunyan. Who doesn’t remember searching for Waldo in cluttered crowd scene illustrations? Throw on a striped shirt and hat along with some wide glasses to remind everyone of the classic books. 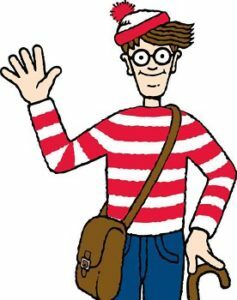 Also, if you’re feeling nostalgic you can search for Waldo and friends on the Where’s Waldo website. Here’s another that only requires household items. If you have sticky labels at home, write a different name on each of them and stick them all over a plain t-shirt. Like that, you just became an identity thief.